Stanley Belt: Aren't you overacting a little bit, Miss Bawling... Balin... Balin? It's a movie, you see? I'm fine. Uh, the people in the theater know I ain't gonna die. Here, it's a movie stage. Here, look at this, see? There's wires and lights and I'm gonna make more movies, so I couldn't die. It's like a "make-believe." It's a dumb city. The Prolific, Near-Genius, Self-Indulgent, and as Always Self-Referential Jerry Lewis is at it Again. Pushing Film Conventions just a Nudge, not Over the Edge, Never Wanting to be Totally Dismissed and Forever Seeking Approval, He Managed to be Creative as well as, Like Most Comedians, Inconsistent. Jerry's Fans Rate this One Pretty HIgh, some Considering it His Best along with The Nutty Professor (1963). It is Deeper than His Other Movies and Lewis, who was a Constant Thinker, seemed to be Thinking Overtime on this One. 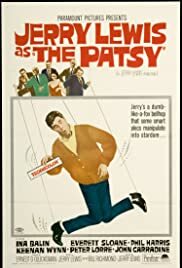 Like All Jerry Lewis Movies this has some Very Funny Bits and His Comic Timing is in Evident Here with a Scene Involving Voice Lessons and Antiques. The Sight Gags in Jerry's Movies are Consistently Innovative and Succeed without Fail, One after Another. Armed with an All-Star Supporting Cast and a Number of Cameos, the Perennial Clown just might have Reached too Far on this One because in this Film when it is Embarrassing (most Jerry Lewis Films include cringe-inducements) it is Really Embarrassing, like in the Nightclub Scene. Overall, this is One of Jerry's more Ambitious Movies and Probably One of HIs Best, although that's Debatable. Still if You are one of those that can Only take a Smattering of the Jerry Lewis Charm, this is Probably one You should Check Out. It's got it All.